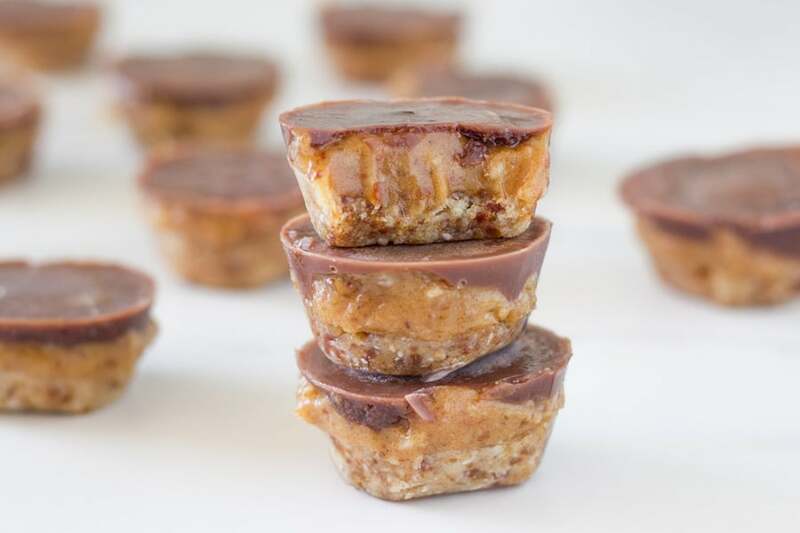 Raw Caramel Slice Bites is the best raw dessert ever. You can’t beat the combo of the coco-nutty base with the gooey caramel and the raw chocolate on top. Raw caramel slice is my favourite dessert ever!! It is one of the very first recipes that I shared on Becomingness and has always has been at the top of my favourite desserts list! I have even also made a few variations over the past few years, including, raw caramel macadamia bliss balls, best ever raw caramel brownie slice, raw chocolate caramel macadamia truffles and now these raw caramel slice bites. I absolutely love the combination of the coco-nutty base with the gooey caramel and the raw chocolate on top. The reason I made them into smaller bite size pieces is in response to a question I am asked sometimes about how to cut my raw slices without the chocolate cracking on top. It does not always happen. But when it does, it can be frustrating. Especially, when you are serving them to guests. Yep, that has happened to me before. A few tips on that…. Use a very hot knife to cut the slice. 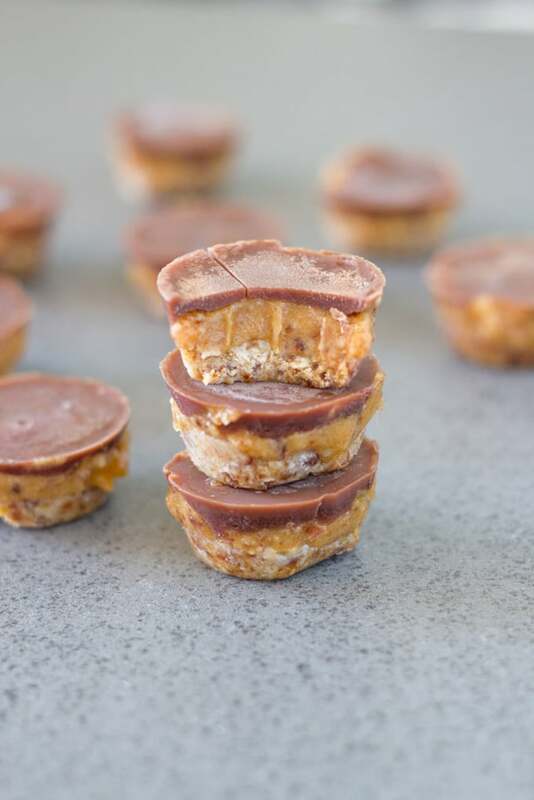 I have made it even easier now, with these raw caramel slice bites. It does require a little extra preparation, due to dividing each mixture 24 times (I just use a teaspoon to do that). But, it is really worth it. 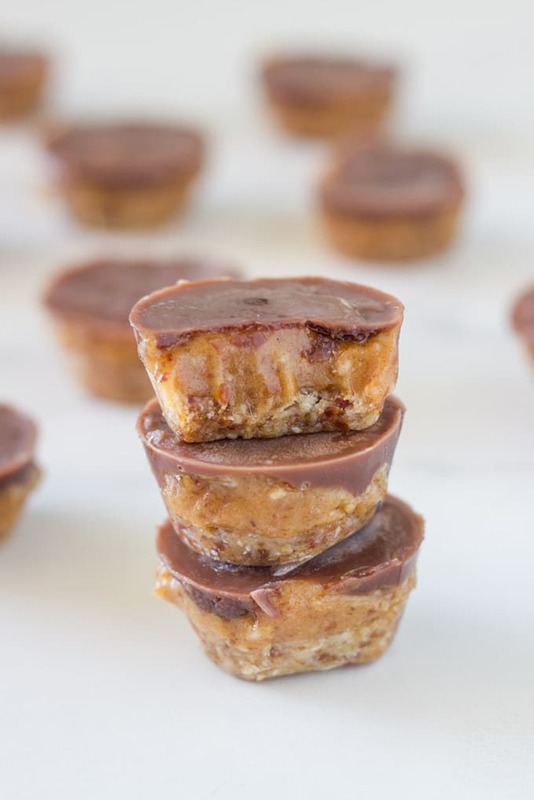 Raw Caramel Slice Bites is the best raw dessert ever. You can't beat the combo of the coco-nutty base with the gooey caramel and the raw chocolate on top. To make the base layer, add the ingredients to a high speed blender or food processor and blend until it resembles fine crumbs and sticks together when pressed. Spoon mixture into a 24 mini muffin pan (see note below) and press down with the back of a teaspoon. Place it in the freezer. To make the caramel layer, add the ingredients to a high speed blender and process until completely combined and smooth. Spoon the mixture onto the bases and smooth over with the back of a teaspoon (see note below) and place back into the freezer for at least 1 hour to set. To make the chocolate layer, melt the coconut oil in saucepan on low heat. Once melted, remove from heat and add the sweetener. Whisk briskly until well combined. Then add the cacao powder, stirring until well mixed through. Pour the chocolate on top of the caramel layer and place back into the freezer and let it set completely, approximately 3-4 hours. Once frozen, they are much easier to remove. I keep mine store in the freezer in an air tight container and remove them a few minutes before serving/eating. I recommend using either a mini silicon muffin tray or cut out little strips of baking paper to use as tabs at the bottom of the regular mini muffin tray, to make it easier to remove them from the muffin tray. Cook time does not include the time it takes for the raw caramel slice bites to freeze — approximately 3-4 hours, depending on the temperature of your freezer. These are amazing! I made it in a square tin and they turned out great. Just doubled the ingredients. So nice and satisfied those gravings ? These were great! The amounts spot on 😀 Couple of changes I did on the second round.. Used silicon moulds – easy clean up and quicker than paper strips.. AND you NEED to add some coconut oil to the caramel layer to help it set – my first batch squished out.. added 1.5tbsp to second lot which helped.. also used soaked dried dates on the 2nd batch no worries at all – chucked a couple extra ones in for good measure 🙂 thanks! 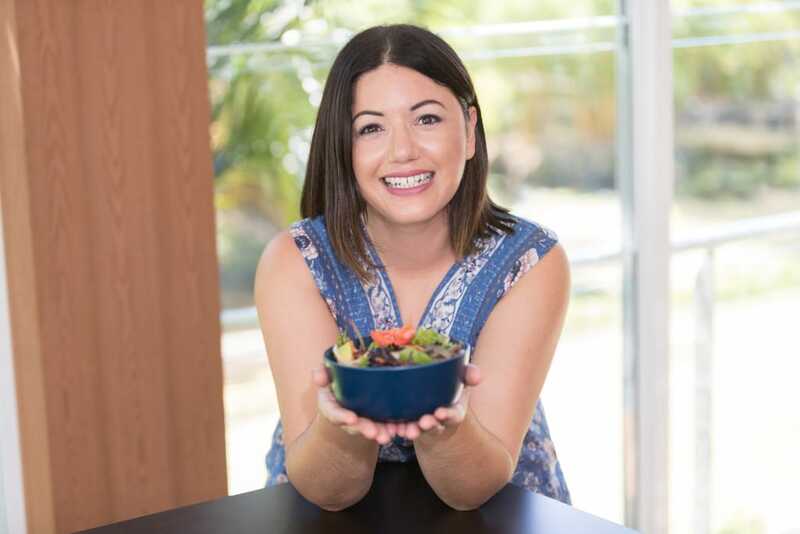 These were so good I had to make a second batch to actually take to my event – the family ate the entire first one!